A political rally in progress; government is weak, corruption is widespread and foreign investments are easily accepted without making the local people benefit as well. I think this may have been a gate of Banteay Kdei, but am not sure. We were on our way to Ta Keo. We drove past a series of towers, Prasats Suor Prat, their use is obscure; this is near Terrace of the Leper King. And so we arrived at Ta Keo temple. Ta Keo is a temple-mountain in Angkor, possibly the first to be built entirely of sandstone by Khmers. It came highly recommended on various websites, so we included Ta Keo on our 3rd and last day of visit to the Angkor temples. For this visit we chartered a tuk-tuk. The way things go here: our driver, Su Thorn, who drove us in a van on the excursion the day before asked us how long we stayed and if he could be of service the next day..? Upon which we said 'no, we'll hire a tuk-tuk'. On which he replied 'I have a tuk-tuk'! We paid US$ 15 plus tip. 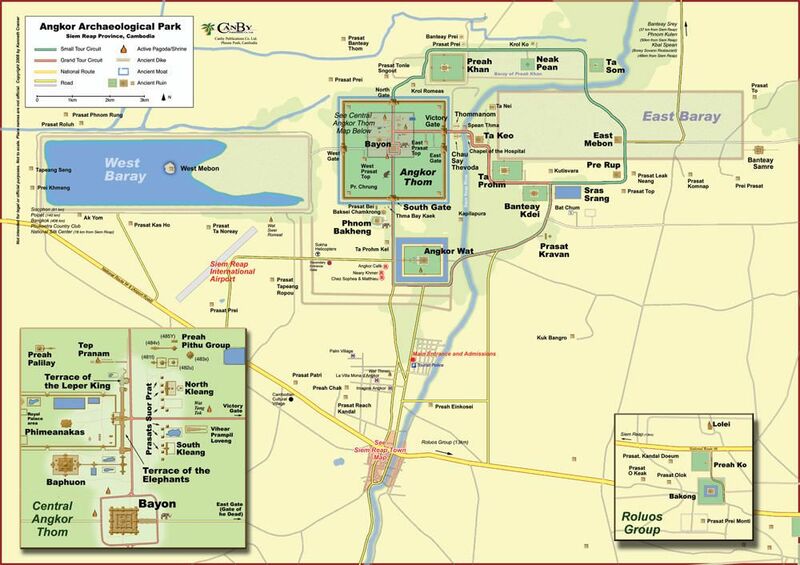 So we planned visits to Ta Keo, Preah Khan and Ta Som temples. Only at breakfast on this day, 30 minutes before our driver showed up, we realized we should have gone for a sunset photoshoot! But it was too late to change the plan and our pass was only valid for 3 days. I blame the heat, half the time I couldn't think straight and had decided not to plan too strictly this trip! Ta Keo had to be the state temple of Jayavarman V, son of Rajendravarman, who had built Pre Rup (see Day 2). 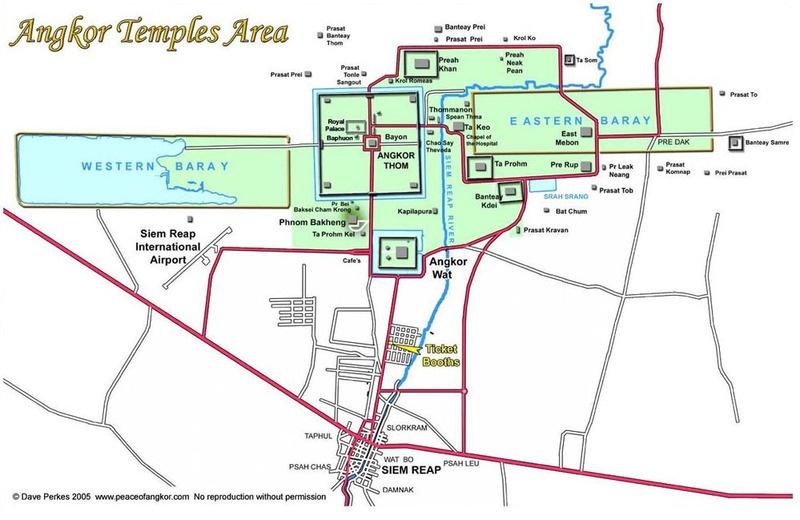 Like Pre Rup, it has 5 sanctuary towers arranged in a quincunx, built on the uppermost level of five-tier pyramid consisting of overlapping terraces (a step pyramid), surrounded by moat, as a symbolic depiction of Mount Meru. Ta Keo's particularly massive appearance is due to the more or less absence of external decorations, as carving had just begun when the works stopped. had succeeded his father, Rajendravarman). Ta Keo was dedicated some time around 1000. The temple was continuously in use, as a cult center, until the 13th century. ongoing. It has been rumored that the entire Angkor complex was to be copied & to be rebuild in India, to safeguard the heritage. But this could have negative influence on the (Chinese) tourist industry. I like the atmosphere of a temple surrounded by jungle here. 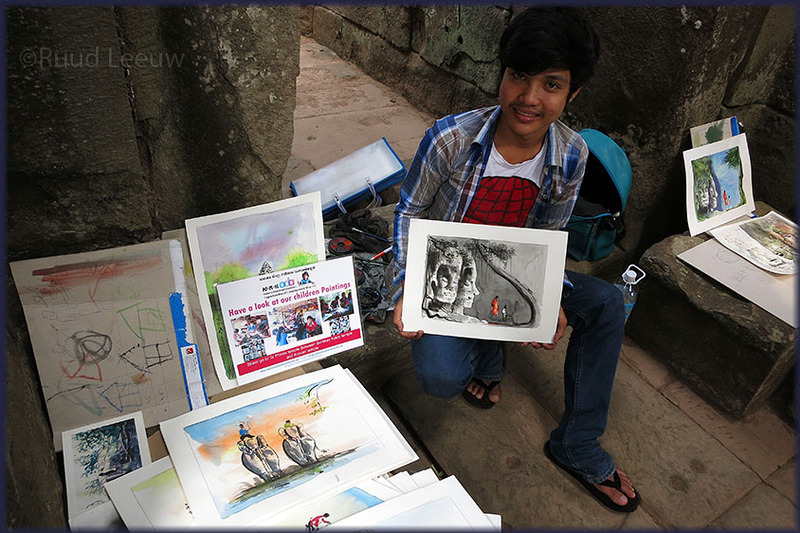 I came across a very talented young man here; he normally sits at Angkor Wat but found that morning his usual location taken. Business was slow at this spot; while Ta Keo comes recommended in the travel guides, it is a steep climb up to where he sat and only a few people had taken the trouble. I thought his work was brilliant. There is a studio among the Angkor temples, but did not get round to visiting it. Bought two paintings by him (including the one he's holding), am very pleased with them. From Ta Keo to Preah Khan; and our final visit Ta Som sits on the right of Preah Khan. Made our driver stop for this beautiful gate. The naga is severely damaged but the smiling face is intact, probably cleaned. The same gate, seen from the other side. A chance meeting with women gathering fire wood. Note the naga in the background. Preah Khan was built in the 12th century for King Jayavarman VII. It is located northeast of Angkor Thom. Like the nearby Ta Prohm, Preah Khan has been left largely unrestored, with numerous trees and other vegetation growing among the ruins. Preah Khan was built on the site of Jayavarman VII's victory over the invading Chams in 1191. The outer wall of Preah Khan is of laterite, and bears 72 garudas holding nagas, at 50 m intervals. Surrounded by a moat, it measures 800 by 700 m and encloses an area of 56 hectares (140 acres). The rearing head of Naga is damaged, but there is plenty of detail to enjoy. The Naga King is a cobra-like serpent with seven heads. He is a God of the Underworld; he is the Lord of Kampuchea (Cambodia); he is a symbol of the nature, the land, the water, and of female power. The temple is still largely unrestored; the initial clearing was from 1927 to 1932. Free-standing statues have been removed for safe-keeping and there has been further consolidation and restoration work. Clearing works were undertaken with a constant respect for the large trees which gives the composition an exciting presentation. we would have not seen otherwise. Not for free, of course. Richly decorated; nature may have put the green cast on it, don't know where the red dye comes from. Isn't this superb, out of this world? This actually looks like a multi-storied house; haven't seen anything like it at other temples. Since 1991, the Preah Khan site has been maintained by the World Monuments Fund. It has continued the cautious approach to restoration, believing that to go further would involve too much guesswork, and prefers to respect the ruined nature of the temple. And again a building seperate from the temple, something I haven't seen much at other temples. These 'strangler fig trees' (Ficus religiosa): absolutely brilliant, eh? Parched while sweating profusely, I made my way to where my business was eagerly anticipated! A fresh pineapple is a fine remedy for thirst. She wielded that bloody sharp knife expertedly. Very kind people. Our driver took us to Neak Poan, a small temple next to Ta Som. It is surrounded by a flooded area. Unfortunately we couldn't get any closer than this, a barrier blocked the way. Preah Khan Baray; it was built during the reign of King Jayavarman VII. Neak Pean was originally designed for medical purposes, as it is one of the many hospitals that Jayavarman VII built. It is based on the ancient Hindu belief of balance. Four connected pools represent Water, Earth, Fire and Wind. We could view it only from the base and not walk around it; there was no explanation for the limited access. Disappointing. But it was right across Ta Som temple, so I guess our tuk-tuk driver delivered us to this temple as a kind gesture. Our 'last' temple; by this time we were getting saturated, we'd seen enough temples. But one more couldn't hurt. Ta Som was built at the end of the 12th century for King Jayavarman VII. It is located north east of Angkor Thom and just east of Neak Pean. The temple consists of a single shrine located on one level and surrounded by enclosure laterite walls. Like the nearby Preah Khan and Ta Prohm the temple was left largely unrestored, with numerous trees and other vegetation growing among the ruins. Something about a male and female symbol, but I lost the details of all that. There is incredible detail in these figurines, e.g. the facial expressions are all different. Study the info on Wikipedia, as it has an image of a gate, 'gopura', I regret to have missed. But it was enough, more than enough. Enjoyed it all tremendously and there is always that 'I want it all'.., but no.